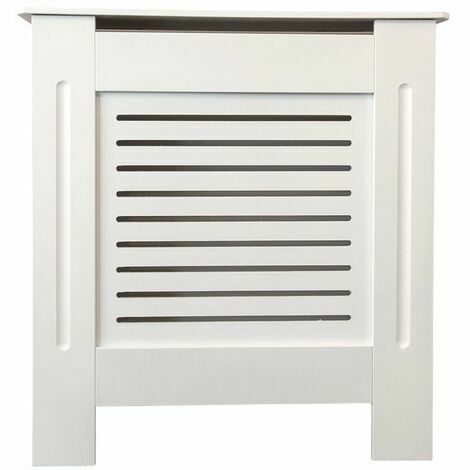 This ready painted white Jack Stonehouse radiator cover is perfect for freshening up your room and for placing your favourite photographs or ornaments. This attractive, modern design has chamfered edges and a front grill panel with horizontal slots. For added detail, the front facing uprights have a smooth, vertical rounded groove crafted into them. The main body of the cover is constructed from 13mm thick MDF and the grill from 3mm MDF. Fittings are included so you can even mount invisibly to your wall. - External size: 78 x 81.5 x 19cm. - Internal size: 69.5 x 80.2 x 16.7cm. Helping to transform your house into a home and make hectic daily life that little bit easier. Jack Stonehouse was created with the ethos of delivery stylish looking and premium quality homeware at affordable prices.